What a wonderful blessing for five Women of Grace ladies to go on a pilgrimage to the EWTN Studios and the Shrine of the Most Blessed Sacrament in Alabama last month. Many thanks to our leader, Maria Lane, for suggesting this as a pilgrimage destination for our group and then providing the rooms! The ride from Jasper, Georgia to Cullman, Alabama is about a 3 ½ hour drive. It is a long drive, but well worth it, as the scenery is just beautiful. 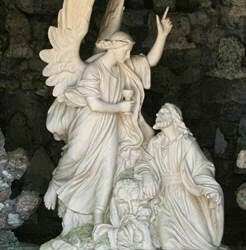 Cullman is home of the Ave Maria Grotto, a landscaped, 4-acre park in an old quarry on the grounds of St. Bernard Abbey, providing a garden setting for 125 miniature reproductions of some of the most famous religious structures of the world. The miniature reproductions were the work of Brother Joseph Zoettl, of monk of the Abbey. They say dynamite comes in small packages and dynamite is just what this incredibly holy and talented man was, who was not much taller than a fire hydrant. His miniature works will both amaze you and take your breath away. After lunch, we drove down to Irondale to tour EWTN. We visited the chapel, and later were taken through the entire studio, learned a lot about radio and TV broadcasting, and actually got to see the set where Women of Grace is filmed. We spent the night in Irondale. The next morning, after a delicious breakfast at the hotel, we were on our way to Hanceville, to visit the Shrine. As we came upon the Shrine, we were all overwhelmed with both its beauty and grandeur. This writer cannot speak for all of us on this, but I personally was overcome with the feeling of holiness and the presence of God. Anyway, the first thing we did was to go to the Castle of San Miguel, which is located just opposite and on the other side of the Piazza from where the Shrine is. This 13th century Castle not only contains a conference room and eating facilities, but also the Gift Shop of El Nino, where some of us (me), came close to going broke! Our Shrine tour was postponed as we awaited the arrival of two busloads of children. After a short discussion, we decided to take the tour on our own. So, off we went starting with the Crèche. The Crèche is a small Chapel located next to the Castle and contains a life-size Nativity display. It looks as if you are walking into the Holy Cave, but is set up like a Chapel with pews, candles, and two stained glass windows, making a peaceful place to pray and meditate. We were due to attend Mass at noon in the Lower Crypt Church, but found out we would be unable to do that due to a conference being held there. It was quite a walk to get from the Crèche to the Shrine, as you have to cross the Piazza and Colonnade, which is HUGE! So huge in fact that it has the capacity to hold up to 30,000 people. As we walked across this vast area, long arched walkways are on your right and left. The one on the right contained the Way of the Cross, which ended with a life size, and VERY realistic Crucifix, which brought this writer to tears. As the Church bells called us to noon Mass, we made our way to the Temple of the Divine Child, where we were all in awe with the beauty and sacredness of this holy place. Before Mass, we got to hear the beautiful voices of the cloistered nuns and to pray the Rosary with them. The Mass was celebrated by Fr. John Paul Mary, MFVA. The tabernacle containing the Most Blessed Sacrament is a smaller scale replica of one in a Gothic Church. Naturally, the first thing we saw was the HUGE and imposing monstrance containing the exposed host, the Real Presence of Our Lord. This monstrance is over seven feet tall, the second largest in the world. The Shrine and Monastery was designed in the Romanesque-Gothic design and was inspired by 13th century Franciscan churches, particularly the ones in Assisi and Umbria, Italy. The Monastery is home to the Poor Clare’s of Perpetual Adoration, who are dedicated to a life inspired by St. Francis and St. Clare. After Mass, we made our way back across the Piazza to take a tour of the John Paul II Eucharistic Center, which was led by Brother Andrew, who told us about the history of the Eucharist. Lastly, we visited the replica of the miraculous Grotto in Lourdes, France where our Lady appeared and identified herself as Our Lady of the Immaculate Conception. At the Grotto below the Mary statue is a plaque containing a stone from the actual rock in Lourdes, France. Also, at the altar of the Grotto there are 33 relics of the saints. Mother Angelica dedicated the entire property to the Divine Child. In love, all are welcomed here whether Catholic, Protestant, or those still searching for God. We needed another day to see all that we missed due to time constraints. It is the prayer and hope of the Women of Grace that if we make another pilgrimage to the Shrine of the Most Blessed Sacrament, many more ladies will join us. Our leader, Maria Lane, asked me to let all our beautiful Women of Grace know that we will start again in January with a brand new and exciting session. Please join us!